1,300 square feet. Generous by apartment dweller standards, but miniscule when compared to most single-family homes designed by architects. 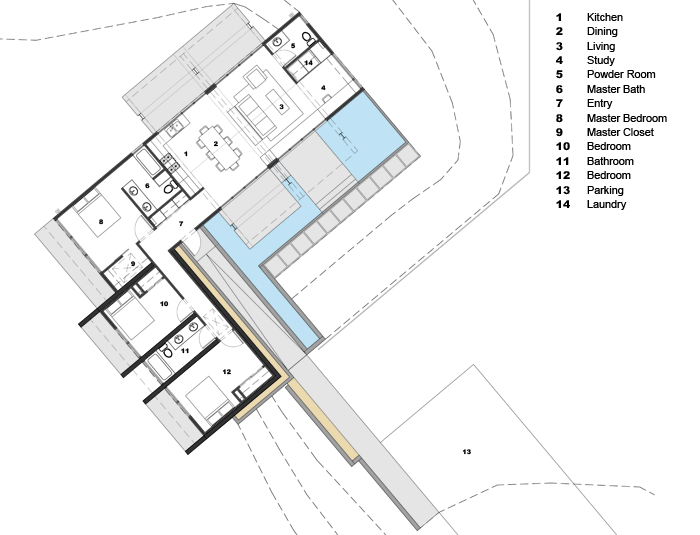 The 1300 Project is a theoretical exploration into the design of a moderately scaled, 3-bedroom single-family residence that is efficient in plan and rich in spatial experience. It seeks to illustrate the value of living in a well-designed, moderately scaled space. The layout is designed around the concept of procession. From the parking to the entry and throughout the house, visitors are treated to unfolding vignettes of the building. Upon arrival at the parking pad, you descend down a gentle ramp to the entry. Landscaped walls and plantings obscure the building's form—allowing the building to slowly reveal itself to the occupant. The home's strong connections to the outdoors can be seen throughout the building. The public areas of the house transition to the outdoors with an expansive deck surrounded by a reflecting pool. Within the private wing each bedroom has a small, private outdoor space that allows for a more intimate outdoor experience.